If you want to get on the cheap flight from Durban to Johannesburg, then type your details into the flight bookings engine, see what airfare it spits out. Simple. You have the option of flying to O.R. Tambo International Airport (JNB, with Kulula, Mango, SAA & BA Comair) or Lanseria International Airport (HLA, now both Kulula and Mango from October 2015). If you're looking for a business class or a full service airline, then book with South African Airways or British Airways Comair. Amongst the low cost carriers there are both Kulula and Mango flights from King Shaka to Johannesburg. Ask for Help - our travel consultants are itching to help! Durban to Johannesburg is the shortest of the so-called "golden triangle", so enjoy your flight whilst it lasts - it wont be long before you hit the ground again. Flight price inflation from Durban to Johannesburg compares the cost of the cheapest flight in a survey to what it was a year previously. This may be distorted by particular events on the date (e.g. if it was the Friday before a long weekend, flight prices would be a lot higher). Prices subject to rapid change. Unless it's actually the morning of the flight special, it's likely that it's sold out. Flights from Durban to Johannesburg take some 1h10m. FlySafair offered the cheapest flight from Durban to Johannesburg this May for The Script live. Only flights leaving Durban for Johannesburg between 17h00 & 2050. Flight, bus & train prices are constantly updated, so the travel prices from Durban to Johannesburg listed are out of -date and for information purposes only. The cheapest travel option from Durban to Johannesburg for the Prime Circle Concert was offered by Shosholoza Meyl. British Airways continues to offer the most affordable business class rates on the Durban to Johannesburg route. An alternative is to drive from Durban to Johannesburg. It's a pretty simple drive along the N3 national Road; through Pinetown, Howick, Estcourt and Harrismith. The driving distance from Durban to Johannesburg is some 600km. If you don't want to drive yourself, you can catch a bus trip from Durban to Johannesburg. Spoornet's Shosholoza Meyl operates train trips from Durban to Johannesburg, and their central reservations may be contacted at 086 000 8888. Here's where you can find Johannesburg hotels. 17 Aug 2015 : Mango Airlines announced that they will start flying Durban-Lanseria from the 15th of October 2015. 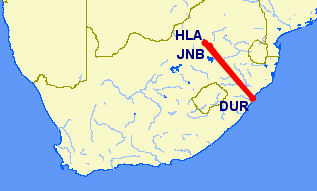 23 Aug 2013 : SA Express flights to Johannesburg from Durban are increased to include an extra Friday and Sunday flight, which is scheduled to leave DUR at 16h45. 2 Nov 2012 : The last 1time DUR-JNB flight, after the airline files for liquidation. 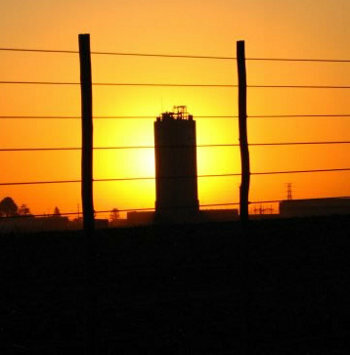 6 Jun 2012 : 1time airline quits flying from Durban to Johannesburg Lanseria Airport. 1 Aug 2011 : Velvet Sky airline increases its flight frequency from Durban to Joburg, from 2 to 3 daily flights. 28 Oct 2008 : Kulula Durban to Johannesburg Lanseria is changed to 2 daily flights (except Saturdays).